A cut-away wall reveals a small bedroom where an angel appears to Pope Sergius in his sleep. The angel tells Sergius that the bishop Saint Lambert has been assassinated and Sergius is to appoint a new bishop, Saint Hubert. The angel holds a bishop's miter and crozier formerly belonging to Saint Lambert. To the right, the Pope and two cardinals go out into a brick enclosure, meeting a lawyer or noble and a Franciscan friar, who both kneel before the papal retinue and present petitions requesting benefits or indulgences. In the far distance, on the steps of the early Saint Peter's Cathedral, Pope Sergius presents Saint Hubert with the bishop's miter and staff. The artists made an imaginative effort to recreate Rome as it would have appeared at that time. The depiction of minutely detailed objects and the ability to portray space in a convincing manner were among the major achievements of Netherlandish painters in the 1400s. 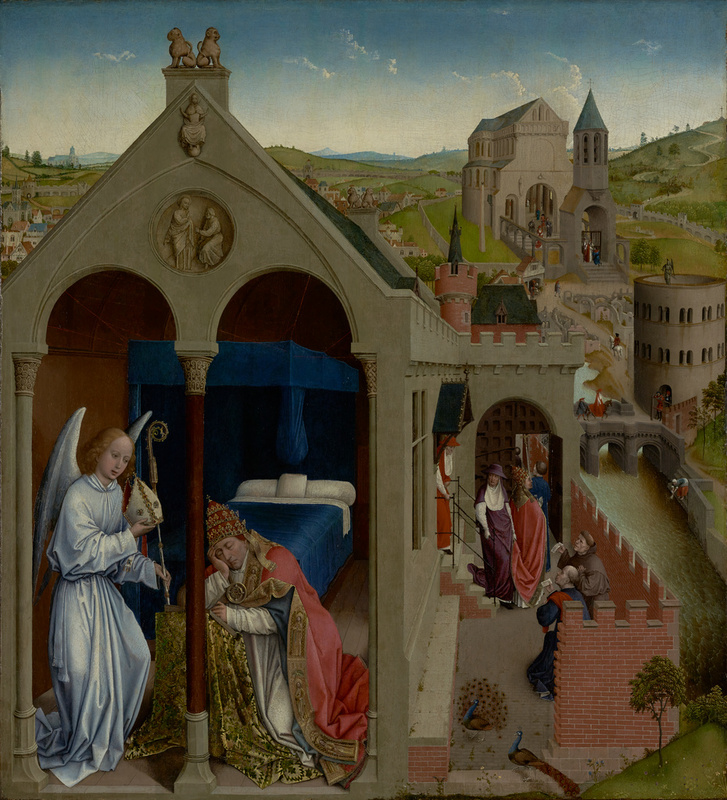 The Dream of Pope Sergius and its companion, The Exhumation of Saint Hubert in the National Gallery, London, were probably wings from a lost altarpiece that stood in the Chapel of Saint Hubert in the church of Saint Gudule, Brussels. Source: Dubuisson-Aubenay ca. 1623 recorded having seen in the church of St. Gudule a painting in two parts; description in accord with Getty painting and National Gallery, London Exhibition. Webb, sold to Henry Labouchère, 1851. Henry Labouchère, first baron Taunton, 1798 - 1869 (Stoke Park, Stoke Poges, Buckinghamshire, England; Quantock Lodge, Bridgewater, Somerset, England), by inheritance (as a life interest only) to his second wife, Mary Matilda Georgiana Labouchère, 1869. Source: JPGM, Paintings Department, curatorial files, correspondence with Barry Phillips, November 27, 2018; Quantock Lodge heirloom inventory, 1870, no. 103. Mary Matilda Georgiana Labouchère, baroness of Taunton, 1823 - 1892 (Quantock Lodge, Bridgewater, Somerset, England), by inheritance to Henry Labouchère's daughter by his first marriage, Mary Dorothy (Labouchère) Stanley, 1892. Source: JPGM, Paintings Department, curatorial files, correspondence with Barry Phillips, November 27, 2018; Quantock Lodge heirloom inventory (1914), no. 103. Mary Dorothy (Labouchère) Stanley, 1842 - 1920 (Quantock Lodge, Bridgewater, Somerset, England) and Edward Arthur Vesey Stanley, 1879 - 1941 (Quantock Lodge, Bridgewater, Somerset, England), probably sold privately in this period by Mary Dorothy (Labouchère) Stanley's son, Edward Arthur Vesey Stanley. Source: JPGM, Paintings Department, curatorial files, correspondence with Barry Phillips, November 27, 2018. Source: Photo in Courtauld Institute of Art, Witt Library. Mortimer Leo Schiff, American, 1877 - 1931 (New York, New York), by inheritance to his son, John Mortimer Schiff, 1931.
von Pannwitz (Haartekamp, The Netherlands; New York, New York; Brazil), sold through French and Company (New York, New York) to the J. Paul Getty Museum, 1972. Dubuisson-Aubenay. "L'Itinerarium Belgicum." Bibliothèque Mazarine, ms. no. 4407 (1623). Waagen, Gustav Friedrich. Treasures of Art in Great Britian: Being an Account of the Chief Collections of Paintings, Drawings, Sculptures, Illuminated Mss., &c., &c. 3 vols. (London: John Murray, 1854), vol. 2, p. 421. Graves, Algernon. Art Sales from Early in the Eighteenth Century to Early in the Twentieth Century, 3 vols. (London: Graves, 1918-21; repr., New York: Franklin, 1970), vol. 3 (1921), p. 284, as Van Dyck. Friedländer, Max J. Die altniederländische Malerei. Vol. 2, Rogier van der Weyden und der Meister von Flémalle (Berlin: P. Cassirer, 1924), p. 97, no. 19, pl. 16. F. Kleinberger Galleries, Inc., exh. cat. (New York and Paris: F. Kleinberger Galleries, Inc., 1924), unpaginated, ill.
Conway, Martin. "New Light on the Flemish Primitives." Burlington Magazine 48, no. 274 (January 1926), p. 29, fig. B.
Vitzthum. "Friederich Winkler: Die Flämische Buchmalerei des 15. und 16. Jahrhunderts." Repetorium für Kunstwissenschaft 48 (1927), p. 270. Buchner, Ernst, and Karl Feuchtmayr. Beiträge zur Geschichte der Deutschen Kunst. Vol. 2, Augsburger Kunst der Spätgotik und Renaissance (Augsburg: B. Filser, 1928), p. 7, 11, ill.
Destrée, Jules. "Le maître dit de Flémalle: Robert Campin." La Revue de l'Art Ancien et Moderne 32, no. 293 (February 1928), p. 81. Fierens-Gevaert, Hippolyte. Histoire de la peinture flamande des origines à le fin du XVe siècle. 3 vols. (Paris and Brussels: Les Éditions G. van Oes, 1927-29), vol. 2 (1928), p. 48. Vaughn, Malcolm. "Rogier van der Weyden in America." International Studio: Associated with the Connoisseur 90 (May-August 1928), pp. 43-45. Friedländer, Max J., ed. Catalogue of a Loan Exhibition of Flemish Primitives in Aid of the Free Milk Fund for Babies, Inc., exh. cat. (New York: F. Kleinberger, Inc., 1929), p. 46-47, no. 10, ill.
Destrée, Jules. Rogier de la Pasture-van der Weyden (Paris and Brussels: Les Éditions G. van Oest, 1930), vol. 2, unpaginated, pl. 118. Destrée, Jules. Rogier de la Pasture-van der Weyden (Paris and Brussels: Les Éditions G. van Oest, 1930), vol. 1, pp. 171-72.
de Ricci, Seymour. "Le maître de l'exhumation de Saint Hubert." In Mélanges Hulin de Loo (Brussels and Paris: Librairie Nationale d'art et d'histoire, 1931), pp. 285-91. Coenen, C. J. "Deux tableaux conservés à Londres et à New York provenant de Saint-Pierre à Liège." Fédération archéologique et historique de Belgique, XXIXe Session, Congrès de Liège, no. 4 (1932), pp. 208-27. Rolland, Paul. Les Primitifs Tournaisiens. Peintres et Sculpteurs (Brussels and Paris: Librairie Nationale d'art et d'histoire, 1932), p. 63, pl. II, figs. 3-4. Catalogue of a Century of Progress Exhibition of Paintings and Sculpture, exh. cat. (Chicago: Art Institute of Chicago, with Lakeside Press, 1934), p. 23, pl. 24. Gerstenberg. "Literaturbericht. Paul Rolland. Les Primitifs Tournaisiens: Peintres et Sculpteurs." Zeitschrift für Kunstgeschichte 3 (1934), pp. 194-96. Kerber, Ottmar. "Rogier van der Weyden und die Anfänge der neuzeitlichen Tafelmalerei." Inaugural diss. (Ludwig-Maximilians Universitat zu Munchen, 1936), p. 60. Scheeuwen, L. "Notizen und Nachrichten. Ottmar Kerber, Rogier van der Weyden und die Anfänge der neuzeitlichen Tafelmalerie, diss. phil. Müchen, Kallmünz, 1936." Zeitschrift für Kunstgeschichte 5 (1936), pp. 353-54. Borenius, T. "Die Auktion Schiff. London." Pantheon 21 (June 1938), p. 200. Borenius, T. "Die Auktion der Kunstsammlungen Mortimer L. Schiff." Pantheon 22 (August 1938), pp. 258-59, 262, ill.
Schöne, Wolfgang. Dieric Bouts and seine Schule (Berlin and Leipzig: 1938), p. 64-65. Christie, Manson & Woods, London. Catalogue of Important Pictures and Drawings by Old Masters: Being a Part of the Collection Formed by the Late Mortimer L. Schiff, Esq […]. June 24,1938, pp. 31-32, no. 84, ill.
Tolnay, Charles de. Le Maître de Flémalle et les frères van Eyck (Brussels: Éditions de la connaissance, 1939), p. 58, no. 14. Catalogus tentoonstelling van Schilderijen beeldhouwwerken en teekeningen uit particuliere verzamelingen in Nederland, exh. cat. (Rotterdam: Museum Boymans, 1939), p. 18, no. 47, afb. IX, ill.
Friedländer, Max J. "De Kersttentoonstelling in Museum Boymans te Rotterdam." Maandblad voor beeldende Kunsten 17 (February 1940), pp. 34, 37, no. 2, ill.
Schmid, Von H. A. “Holbeinstudien.” Zeitschrift Fur Kunstgeschichte 10, no. 1-3 (1941-42), p. 12. Davies, Martin. London National Gallery Catalogues: Early Netherlandish School (London: National Gallery, 1945), pp. 113-15, no. 783. Nederlandsche Kunst van de XVde en XVIde Eeuw, exh. cat. (The Hague: Koninklijk Kabinet van Schilderijen, Mauritshuis, 1945), pp. 58-59, no. 84. Glavimans, A. "Notities bij de Primitieven in het Mauritshuis." Phoenix, maandschrift voor beeldende Kunst (1946), p. 51. Halkin, L. "L'Itinérarire de Belgique de Dubuisson-Aubenay (1623-1628)." Revue belge d'archéologie et d'histoire de l'art 16 (1946), pp. 59-61. Beenken, Herman. Rogier van der Weyden (Munich: F. Bruckmann, 1951), p. 99. Panofsky, Erwin. Early Netherlandish Painting: Its Origins and Character. 2 vols. (Cambridge: Harvard University Press, 1953), vol. 2, unpaginated, pl. 245, fig. 396. Panofsky, Erwin. Early Netherlandish Painting: Its Origins and Character. 2 vols. (Cambridge: Harvard University Press, 1953), vol. 1, pp. 425-26, 482. Davies, Martin. Les Primitifs Flamands: I, Corpus de la peinture des anciens Pays-Bas méridionaux au quinzième siècle. 3, The National Gallery London (Antwerp: De Sikkel, 1953-70), vol. 2 (1954), pp. 184, 185, 186, 190, pl. 989. Davies, Martin. London National Gallery Catalogues: Early Netherlandish School (London: National Gallery, 1955), pp. 128-30. Fischel, Lilli. "Die 'Vermählung Mariä' des Prado zu Madrid." Bulletin Musées Royaux des Beaux-Arts, no. 1 (March 1958), pp. 15, 16. Birkmeyer, Karl M. "The Arch Motif in Netherlandish Painting of the Fifteenth Century." The Art Bulletin 43, no. 1 (1961), pp. 1-20, 101-2, 104-12, no. 128. Friedländer, Max J. Early Netherlandish Painting. Vol. 2, Rogier van der Weyden and the Master of Flémalle. Heinz Norden, trans. (Leyden: Sijthoff, 1967), pp. 64, 98, no. 19, pl. 39. Davies, Martin. London National Gallery Catalogues: Early Netherlandish School. 3rd ed., rev. (London: National Gallery, 1968), pp. 173, 174-75. Davies, Martin. Rogier van der Weyden: An Essay, with a Critical Catalogue of Paintings Assigned to Him and to Robert Campin (London: Phaidon, 1972), pp. 219-21, pl. 100. Kerber, Ottmar. "Die Hubertus-Tafeln von Rogier van der Weyden." Pantheon 30, no. 4 (July-August 1972), pp. 292, 296, 297, fig. 4. Kerber, Ottmar. "Buchbesprechungen: Les Primitifs Flamands, Corpus, Leningrad." Pantheon 30, no. 1 (January-February 1972), p. 76. Schabacker, Peter. "Review of M. Davies' Rogier van der Weyden." Art Quarterly 35 (Winter 1972), pp. 423-24. Davies, Martin. Rogier van der Weyden: Essai accompagné d'un catalogue critique des oeuvres qui lui ont été attribuées ainsi qu'à Robert Campin (Brussels: Arcade, 1973), pp. 257-259. Hoffman, Edith Warren. "Simon Marimon or the Master of the Altarpiece of Saint-Bertin: A Problem of Attribution." Scriptorium 27, no. 2 (1973), pp. 263-90, 281n79. The National Gallery: Illustrated General Catalogue (London: National Gallery, 1973), p. 805, no. 783. Bruyn, J. "The Literature of Art: A New Monograph on Rogier." Burlington Magazine 116, no. 858 (September 1974), p. 541. Fredericksen, Burton B., ed. The J. Paul Getty Museum: Greek and Roman Antiquities, Western European Paintings, French Decorative Arts of the Eighteenth Century (Malibu: J. Paul Getty Museum, 1975), pp. 70, 104-5, ill.
Frel, Jiri, Burton B. Fredericksen, and Gillian Wilson. The J. Paul Getty Museum Guidebook (Los Angeles: J. Paul Getty Museum, 1975), p. 54. Fredericksen, Burton B., et al. Guidebook: The J. Paul Getty Museum. 3rd ed. (Malibu: J. Paul Getty Museum, 1976), p. 57. Terner, Rolf. "Zu zwei Hubertus-Taflen aus der Nachfolge Roger van der Weyden in London und Malibu." Zeitschrift für Kunstgeschichte 39, no. 4 (1976), pp. 246ff, pl. 2. Fredericksen, Burton B., Jiří Frel, and Gillian Wilson. Guidebook: The J. Paul Getty Museum. 4th ed. Sandra Morgan, ed. (Malibu: J. Paul Getty Museum, 1978), pp. 72-73, ill.
Bruyn, J. "The Concept of School." In Authentication in the Visual Arts: A Multi-Dsciplinary Symposium, Amsterdam, 12th March, 1977 (Amsterdam: B. M. Israël, 1979), pp. 13-16, fig. 9. Rogier van der Weyden, Rogier de le Pasture: Peintre officiel de la Ville de Bruxelles, Portraitis de la Cour de Bourgogne, exh. cat. (Brussels: Centre culturel du Crédit communal de Belgique, 1979), pp. 138-39, no. 2. Strachwitz, A.G. "Brüssels offizieller Stadtmaler." Weltkunst 49, no. 23 (December 1979), p. 3147, no. 23. Fredericksen, Burton B. Masterpieces of Painting in the J. Paul Getty Museum (Malibu: J. Paul Getty Museum, 1980), unpaginated, no. 22, ill.
Fredericksen, Burton B., Jiří Frel, and Gillian Wilson. The J. Paul Getty Museum Guidebook. 5th ed. (Malibu: J. Paul Getty Museum, 1980), pp. 58-60, ill.
Corboz, André. Canaletto: Una Venezia Immaginaria. 2 vols. (Milan: Alfieri Electa, 1985), vol. 1, pp. 314-15, pl. 376.
van den Broeck, Paul. Catalogus Schilderijen 14 e en 15 e Eeuw. Koninklijk Museum voor Schone Kunsten Antwerpen (Antwerp: Ministerie van de vlaamse gemeenschap, 1985), p. 16.
van Miegroet, Hans. "Between the Dream of Pope Sergius and Reality: A van der Weyden Problem of Attribution and Date." Zeitschrift für Kunstgeschichte 50, no. 4 (1987), pp. 483-95. Van Miegroet, Hans J. "The Puzzling Underdrawings in the Dream of Pope Sergius in the J. Paul Getty Museum at Malibu: A Problem of Attribution and Date." In Le dessin sous-jacent dans la peinture, colloque VII (Louvain-la-neuve: Collége Érasmus, 1989), pp. 9-23. Van Asperen de Boer, J.R.J., J. Dijkstra and R. van Schoute. "Underdrawing in Paintings of the Rogier van der Weyden and Master of Flémalle groups." Nederlands Kunsthistorisch Jaarboek 41, 1990 (Zwolle: Waanders Uitgevers, 1992), pp. 306-10. Carr, Dawson W., and Mark Leonard. Looking at Paintings: A Guide to Technical Terms (Malibu: J. Paul Getty Museum, with British Museum Press, 1992), pp. 74-75, ill.
Campbell, Lorne. "Rogier van der Weyden and his Workshop." Proceedings of the British Academy 84 (1994), pp. 16-20, fig. 7. Jaffé, David. Summary Catalogue of European Paintings in the J. Paul Getty Museum (Los Angeles: J. Paul Getty Museum, 1997), p. 134, ill.
Kemperdick, Stephan. Der Meister von Flémalle. Die Werkstatt Robert Campins und Rogier van der Weyden (Turnhout: Brepols, 1997), pp. 105, 125, 140-48, 160, 168, 196. Fredericksen, Burton B., et al. Masterpieces of the J. Paul Getty Museum: Paintings (Los Angeles: J. Paul Getty Museum, 1997), pp. 44-45, no. 22, ill., entry by David Jaffé. Squarzina, Silvia Danesi. Tracce per lo studio della cultura figurativa fiamminga e olandese dal XV al XVII secolo (Sant’Oreste: Apeiron, 1997), pp. 62-63, no. 36, ill.
Campbell, Lorne. National Gallery Catalogues: The Fifteenth Century Netherlandish Schools (London: National Gallery Publications, 1998), pp. 407, 417-25, fig. 13.
de Vos, Dirk. Rogier van der Weyden: The Complete Works (Antwerp and New York: Mercatorfonds, with Harry N. Abrams, Inc., 1999), pp. 101-2, 183n9, 215n7, 411-412, no. C11, fig. 135. Rogier van der Weyden in the National Gallery, exh. cat. (London: National Gallery, 1999), unpaginated, fig. 6. Kemperdick, Stephan. Masters of Netherlandish Art: Rogier van der Weyden, 1399/1400-1464. Anthea Bell, trans. (Cologne: Könemann, 1999), unpaginated, no. 23, ill.
Koreny, Fritz, ed. Early Netherlandish Drawings: From Jan van Eyck to Hieronymus Bosch, exh. cat. (Antwerp: Rubenshuis, 2002), p. 93. Allen, Denise, et al. Masterpieces of Painting in the J. Paul Getty Museum. Rev. ed. (Los Angeles: J. Paul Getty Museum, with Thames & Hudson, 2003), pp. 38-39, no. 19, ill., entry by David Jaffé. Ketelsen, Thomas, and Uta Neidhardt, eds. Die fruhen niederländischen Zeichnungen und Gemälde in Dresden, exh. cat. (Munich: Deutscher Kunstverlag, 2005), p. 142. Kemperdick, Stephan, and Jochen Sander, eds. The Master of Flémalle and Rogier van der Weyden: The Birth of Modern Painting, exh. cat. (Frankfurt: Städel Museum, 2009), pp. 297-301, no. 24, ill., entry by Stephan Kemperdick. Kemperdick, Stephan. "The Workshop and Its Working Materials." In The Master of Flémalle and Rogier van der Weyden: The Birth of Modern Painting, exh. cat. Stephan Kemperdick and Jochen Sander, eds. (Frankfurt: Städel Museum, 2009), pp. 100, 101, 112. Kemperdick, Stephan, and Jochen Sander. "The Master of Flémalle, Robert Campin, and Rogier van der Weyden: A Résumé." In The Master of Flémalle and Rogier van der Weyden: The Birth of Modern Painting, exh. cat. Stephan Kemperdick and Jochen Sander, eds. (Frankfurt: Städel Museum, 2009), pp. 156, 159. Klein, Peter. "Dendrochronological Analysis of Panel Paintings Belonging to the Master of Flémalle and Rogier van der Weyden Groups." In The Master of Flémalle and Rogier van der Weyden: The Birth of Modern Painting, exh. cat. Stephan Kemperdick and Jochen Sander, eds. (Frankfurt: Städel Museum, 2009), p. 165. Kemperdick, Stephan. "Robert Campin, Jacques Daret, and Rogier van der Weyden: The Written Sources." In The Master of Flémalle and Rogier van der Weyden: The Birth of Modern Painting, exh. cat. Stephan Kemperdick and Jochen Sander, eds. (Frankfurt: Städel Museum, 2009), p. 70. Reynolds, Catherine. "Bruxelles et la peinture narrative." In L'Héritage de Rogier van der Weyden: La peinture à Bruxelles 1450-1520, exh. cat. Véronique Bücken and Griet Steyaert, eds. (Brussels: Musées royaux des Beaux-Arts de Belgique, with Éditions Lannoo, 2013), pp. 50-51, 52, fig. 32. Saucier, Catherine. A Paradise of Priests: Singing the Civic and Episcopal Hagiography of Medieval Liège (Rochester: University of Rochester Press, 2014), p. 116-17, fig. 3.1. Wolfthal, Diane, and Cathy Metzger. Los Angeles Museums, Corpus of Early Netherlandish Painting (Brussels: Royal Institute for Cultural Heritage, 2014), pp. 140-67. Kemperdick, Stephen. Review of Corpus of Early Netherlandish Painting: Los Angeles Museums, by Diane Wolfthal and Cathy Metzger. Burlington Magazine 159, no. 1373 (August 2017), p. 640.